Posted on June 9, 2017 at 10:03 am. Most students at the Escuela Municipal de Audición y Lenguaje—The Municipal School of Audition and Language (an oral school for the deaf in Guayaquil, Ecuador) are not familiar with sign language because of a lack of resources or cultural stigma that surrounds the use of signs. Henry has a robust program for the Deaf and Hard of Hearing. The program is designed for students with hearing loss or deafness that require a specialized language rich program.The program serves students two years old through fifth grade. The goal of the program is to improve the language and communication skills of its students and provide them with full access to the general education curriculum. 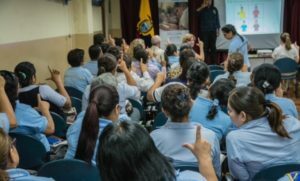 La Fundación Salud Nuevo Comienzo—Foundation of New Start for Health seeks to spread knowledge and break down barriers to allow the use of sign language. Members of the Foundation of a New Start for Health were in Guayaquil, Ecuador last week along with staff from the University of Arizona in order to encourage and teach signing to staff and students. Henry Spanish teacher Susan Ramirez had a friend among the volunteers at the school and decided to host a video-call. Ramirez, along with teachers of the Deaf at Henry, arranged a video-call between our students and their students. Henry Cardenas, Interpreter for the Deaf from Jefferson joined students for the video conference call. He interpreted from Spanish to ASL. 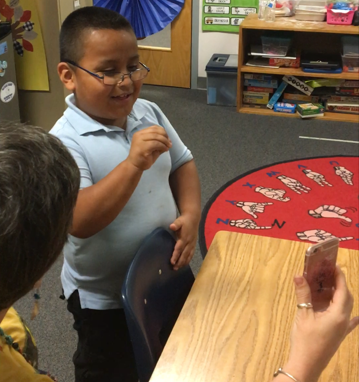 Yoel Gonzalez, a first grade student, who learned to sign last year, has become a proficient signer in a short time period. He was very excited to share his skills. Also present for part of the call was Anthony Mendez, a third grade student and fluent signer, who shared his signing abilities. The many staff members in Ecuador were reportedly very impressed by the signing ability of our students and happy to see ASL in action through an interpreter. They also expressed gratitude at gaining new connections with members of the APS community. We had three languages going simultaneously: ASL, English and Spanish. Cardenas was able to answer many questions posed by teachers and interpreters about logistics and day to day issues of students who use interpreters in schools in the United States.